Watching the surroundings, preventing problems, warning authorities if foretelling signs are detected. In his warning capacity, the eco-guard also plays a teacher’s part with the people he interacts with. The eco-guard sets a diagnostic of the surroundings he is in charge of. 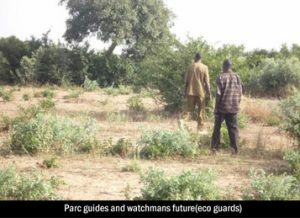 The eco-guard dresses up the list of imbalances and threats (ecosystems out of balance, degradation of landscape and human technical improvements, pollution sources). Ann eco-guard will be well-versed in technical, scientific, and legal knowledge. An eco-guard will also enjoy a good health and good inter-personal skills. An eco-guard will have realized how important biodiversity is and will therefore be poersonnally involved in his task. This structure will operate under the aegis of the GBP and work contracts will be drafted byn GBP. 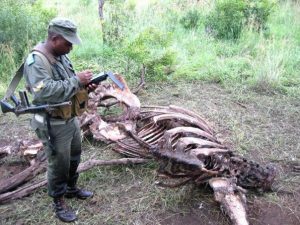 An exception is made for eco-guards who as arm bearing personal – in order to fight poachers – are selected and paid by GBP, but are state employees , legally ‘detached’ by the State, to be employed by GBP. GBP will select applicants (GBP enjoys the right to decline the services of unsuitable applicants).. Qualifying applicants will get their wages, their formation, the various equipments, and their housing facilities from GBP. GBP will sign a Convention with interested States whose purpose is to set the part of each player –State, association- and define the range of powers delegated to eco-guards (verbalizing on serious harm to the environment). This agreement is linked to a 3 year set of goal contract, renewable, binding both parties. The checking of the terms of contract will be implemented through an agreement of governance including the bi-annual meeting of a follow-up joint committee. Together, the beneficiary state and GBP will determine where the structure will sit.